So the three cameras are all running, the board has been clapped, and John Oliver is asking questions to Stephen Hawking for his Sunday night HBO show ‘Last Week Tonight’. Stephen is his first interview for the section of the show called ‘Great Minds: People who think good.’ And John’s asking him to clarify an answer because he can’t tell from Stephen’s tone of voice whether or not he’s being sarcastic. And now Stephen is talking, or at least his computer is talking, all over John’s questions. After 2 more questions, with Stephen’s answer bearing more relevance to the question that is about to be asked rather than the one that was just asked, his carer jumps in to explain that Stephen is laughing so much that he keeps hitting the wrong cues at the wrong time. All three camera operators, myself, Al Beech and Joel Csanyi were holding back laughs. The other 2 had it slightly easier with their locked off shots; Al had John Oliver, and Joel had the wide two-shot. It was me with my shot of Stephen, on the track, and on an 85mm lens that was struggling to keep it steady! I did wonder just for a moment whether Stephen Hawking was using Quantum physics to enable him to answer questions that had not yet been asked. But then I guess they had actually already been asked, in another parallel universe somewhere. In the second half of 2014 year I had two very similar shoots, and I ended up lighting and shooting them in very similar ways. 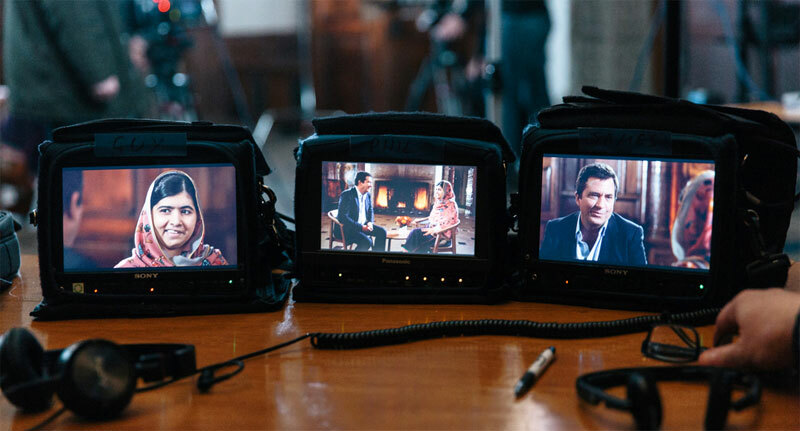 The second shoot was a Leadercast Interview with Malala Yousafzai ,for their upcoming conference. The 17 year old from Pakistan recently won the Nobel Peace Prize for her work in fighting for the right of all girls to education. Both shoots were for American clients and both were shot on location. In each case we used 3 x Canon EOS C300 cameras all running at the same time, linked using Timecode Buddy TRXs with Ray Hill’s Sound Devices mixer as the master source. And of course we used a clapper board as well – always good practice. A clapper board is not only a ‘just in case’ tool, it also helps to settle everyone on set and get everyone focused. Editors like it too so they can see where the shot starts when spooling through at high speed. In terms of glass, we used a mixture of Canon L series, and Samyang Primes. On both occasions the single shot cameras were on Canon 70-200 f/2.8L lenses; for Stephen Hawking the wide two shot was on a 14mm T3.1 Samyang, and for Malala we used a 24mm T1.5 Samyang. The reason for the difference is purely the size of the rooms we had to work in. Any room starts to feel small when you put a film crew in it, and when that film crew consists of 3 cameras, sound, ‘video village’ for director, producer, DIT, makeup and client, and lighting stands it gets pretty tight. The only difference between the two set-ups from a camera point of view was that for the Last Week Tonight interview the director Mike Rubens wanted to put Stephen’s close up camera on track. In the Malala interview the director Andy Hutch and I went with the more conventional ‘wide tracking shot’. When you have 3 cameras all running simultaneously in this situation, without any preplanned camera moves its always better in the edit to only have 1 tracking shot when cutting. For the HBO shoot, which was at Cambridge University, I spent a lot of time on the phone with the Production Manager Dani Drusin in New York talking through logistics and kit requirements. Skype audio was great for this, and free; it really feels like your sat next to them. And then director Mike and John Oliver met us in Cambridge on the day of the shoot, when we had very animated discussions / disagreements about the best way to make a cup of tea; much to the amusement of Mike. I’m actually a ‘non teabag squeezer’, it completely changes the flavour. And of course milk goes in after the teabag comes out. Obviously. Well apparently not, according to other crew members. Both Luke Clarke our DIT / Camera Assistant, and Joel on 3rd Camera squeeze their teabags. …And then Joel says, “The milk has to go in before the teabag comes out otherwise how can you judge the colour! Right?” After we all had our tea in hand, all made in a slightly different way, as if to prove to our new American friend just how important tea really and truly is to a Brit, we started setting, and lighting, in the Potter Room at the Dept of Applied Mathematics. There are two main challenges when lighting for 3 camera angles whilst on location. How do you light for a wide shot without compromising your close-ups singles? And how do you light for close-up shots without the light stands being in the wide-shot? The easy answer is to put you main key light behind the wide 2-shot camera. However this means the wide shot can look very flat, and in the close ups, the key is coming from the wrong side. For my lighting set-up I wanted to be able to key light John and Stephen from the ‘nice side’. For those that know this… skim read this next bit… for those that don’t, this is my favourite lighting lesson. In an interview situation it always looks better if your main light source, either a light or a window, is coming from the same side as your interviewer. So your interviewer sits between the camera and the light source. This is the ‘nice side’. This point is debatable in dramatic situations, but for interviews it really works. In order to do this on location we used boom arms and clamps and what’s called a ‘cross-key’ set up. So each person has their own key light, and that key light acts as a backlight for the other person. Having the light, in this instance a KinoFlo Vista Single, on a boom arm means you can put the stand back out of shot – on the wide – and get the light into a nice position for the close-up shots. And then we had a couple of Dedos to pick out background spots and as extra rim lights, and an LED Light Panel bounced into a Reflector for fill. The interview went very well – and the final cut is very funny. You can see the finished thing on my Showreel page. We did pick up Johns questions afterwards as a ‘safety’ on a clean single but they weren’t needed in the final cut; they went with the dirty singles, which always look nicer anyway. From an editorial perspective I know that John Oliver and their creative team had been working with Stephen before the actual shoot day, in order for Stephen to be able to have enough time to type out his answers and have them ready for the interview. I imagine there was a process of sending things back and forth to each other until their ‘conversation’ was set. And then on the day Stephen had his answers, and quips, all cued up and ready. It was only when he started laughing that the issues arose. My only slight reservation about how it looked was that the ceiling in the room was quite low and as a result I couldn’t get John’s keylight up quite high enough to loose the reflection in his glasses. It is very slight, and it comes and goes. With the time that we had, and the restrictions of the room and of filming all 3 angles at the same time we had to let that one go. But I found that very frustrating. The VT starts with a short montage to go with John’s narration, which was shot by myself and Al Beech, and I had the privilege of filming Stephen in his office whilst he was working on his current lecture – to be given to students the following week. I filmed him as he chose the first half of the alphabet, followed by the second line and then the letter ‘f’. Then he chose the second half of the alphabet, then the fourth line and then he wrote the letter ‘o’. And then he did the same thing to write the letter ‘r’. And then he wrote a ‘space’. One word, finished. Only thousands more to go. The amount of patience and good grace he must have to write like that is incredible. And to write books, books with theories and ideas that have had as much influence as Albert Einstein is absolutely staggering. 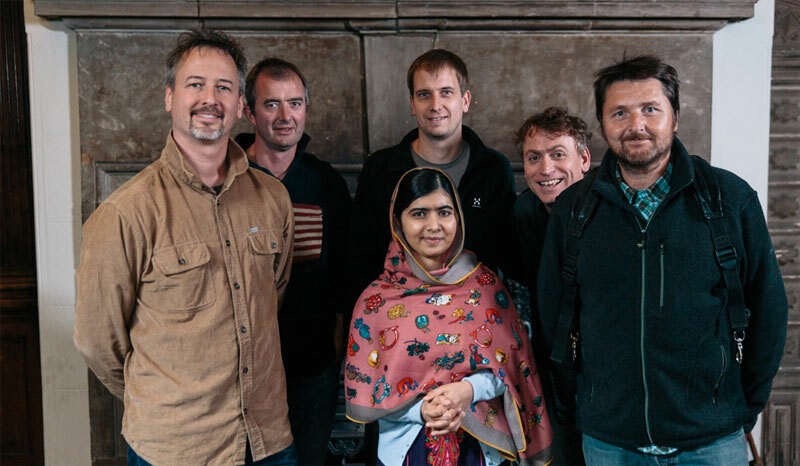 Our filming for the interview with Malala Yousefzai went equally well. We were filming at Aston Hall in Birmingham in a freezing cold 17th century stone floored room. The timing of the interview was even more current as Malala had just received her Nobel Peace price. Also the interview took place the day after the Peshawar School massacre in her own country of Pakistan, so there was a large police presence along with private security as well. It was Andy Hutch directing this shoot. I’ve worked with Andy lots before, and he in turn has done lots for Leadercast. In the run up to the shoot the location had changed innumerable times until it finally settled at Aston Hall, which looked stunning. Andy had sent me video links to two recent examples of Leadercast interviews, with Laura W Bush and Condoleezza Rice. They both looked beautiful, but were also very different in style, which was helpful. (differences in lighting technique, location, and set up) So the bar had been set quite high, and yet we knew we had room to add our own ‘feel’ or ‘style’ to the proceedings. 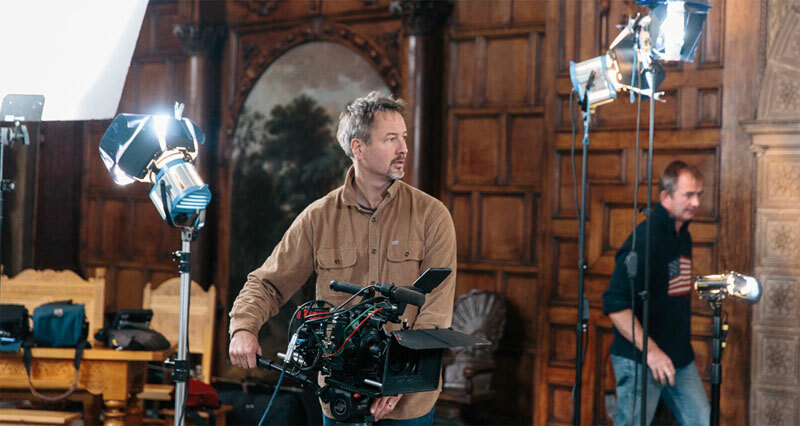 Andy was keen to get some kind of establishing shot at the very top of the film, showing the whole room with lights and cameras etc, and after various options were discussed – Jimmy Jib, steadicam, long track, MoVI rig – we went with steadicam. 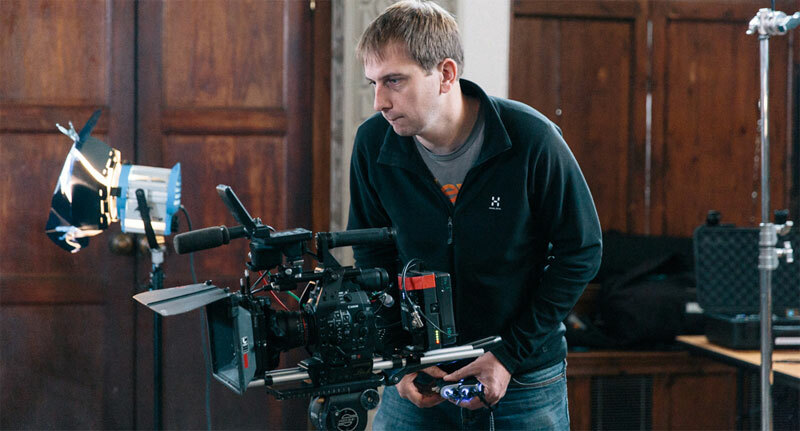 Cineworks, based out of Pinewood Studios, is run by the very talented Guy Linton, and he would be both our Steadicam Op and 2nd camera Op for the interview. His Assistant James Harwood would pull focus – or stop actually as it happened – whilst on the steadicam rig, and then be our 3rd camera Op. Guy is a DoP in his own right as well a Jimmy Jib and Steadicam Op so I was glad to have him on the shoot. It gave me a chance to try and crack his Yorkshire ‘deadpan’ with my best lightbulb jokes. Q .How many continuity-artists does it take to change a lightbulb? A. Lightbulb? What lightbulb? Noone told me about any lightbulb! Q. How many freelance cameramen does it take to change a lightbulb? A. 1. He holds the bulb and the world revolves around him. No? Don’t worry, Guy didn’t laugh either. We shot the steadicam shot at 50fps so that Andy could ramp the speed up and down in the edit. The shot started from outside the front of the building, and then came in through the doors and then around Malala and Henry, our interviewer, to end on a 2-shot of them in font of the fire. By the time everyone was out of makeup and had been briefed the light levels were a little lower outside than they had been – and yet the shot till had a stop-pull from f11 to f4 as the camera came in through those doors! Guy used the Canon CN-E 24mm T1.5 Lens for the shot. 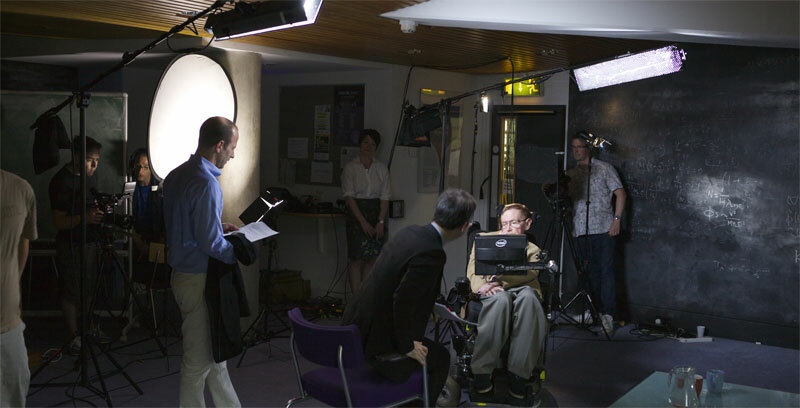 The lighting setup for this interview was very similar to Stephen Hawking’s setup, only it was a much larger room. The cross-key lighting using Kinoflo Vista singles was exactly the same, we just had larger fill lights using 1k and 2k Fesnels bounced into 4×4 poly boards to lift the overall light in the room. Then we used Dedos to pick out spots as before, and there was a lovely ‘kick’ coming through an open door in the back of shot over Malala’s shoulder, made using an LED Light Panel. All three cameras needed french flags to get rid of lens flares coming from the key lights. Much more so in Malala’s setup than Stephen’s as the Vista Singles had no ‘egg crates’ on; another way to increase the overall exposure of the room. My only disappointment of the day was that as the sun started to go down we realized that the light coming through the window in the background of Malala’s close up would not stay the same throughout the hour long interview and so we had to frame it out. The interview is in the edit at the moment, I’ll put it up on my site once it’s finished and I’m allowed to do so. Two very interesting shoots with two very interesting people. Lighting people is my favourite thing to do. And doing it with a correctly made mug of tea in my hand makes it even more enjoyable.